Abstract: A number of studies found that long-term aircraft noise exposure is significantly associated with chronic noise stress and may cause cardiovascular diseases and hypertension. Chicago’s O’Hare Airport drew the most aircraft noise complaints among U.S. airports, increased from 29,000 (2013) to 268,000 (2014) to 4.1 million (2015) to 5 million (2016) to an expected 5.7 million (through the end of 2017),.but no effective solution has been implemented. From the analysis of three potential scenarios, regulating airport noise pollution and reconfiguration of runway utilization would not bring significant effect on noise reduction. On the other hand, by transferring cargo and international passenger traffic to the proposed new airport, current noise pollution is expected to be significantly mitigated by 14 - 18%. Decentralizing air traffic into multiple airports can be an effective remedy for many US mega airports like O'Hare. In conclusion, to accommodate the growing demand for air travel, collective efforts among entire stakeholders are key success factors to explore feasible solutions and minimizing the adverse impacts of aircraft noise pollution on quality of life and public health conditions. 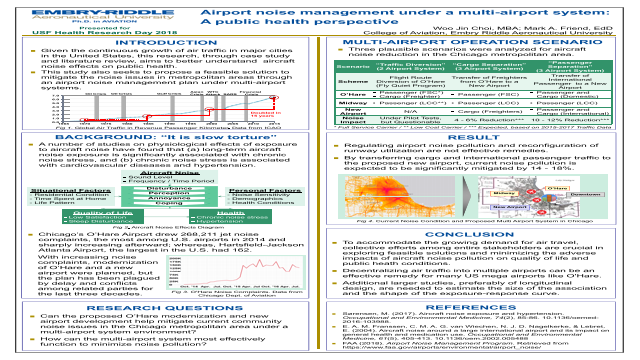 Summary: Given the continuous growth of air traffic in major cities in the United States, this study analyze the impact of aircraft noise on public health and propose a feasible solution to mitigate the noise issues in a Chicago metropolitan area through an airport noise management plan under a multi airport system.References: 	Sørensen, M. (2017). Aircraft noise exposure and hypertension. Occupational and Environmental Medicine, 74(2), 85-86. 10.1136/oemed-2016-103988.